Daniel J. Powell Jr., Ph.D.
Delaware County Community College, 1991. Delaware County Community College, 1993. 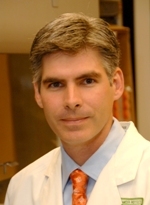 The Powell Lab is actively investigating the application of immune-based therapy for cancer. Building on interrogations in basic T cell biology in the lab, bench-to-bedside translational immunology is being developed, with a strong focus on T cell-based therapy for ovarian cancer. One obstacle to successful immunotherapy is the lack of highly avid, tumor-reactive T cells in multiple cancers. One current focus of the Powell lab is to generate/isolate high avidity, tumor-reactive T cells from heterogenous tumor infiltrating lymphocyte populations in traditionally "non-immunogenic" cancers utilizing novel culture conditions and T cell capture techniques. This in turn will permit downstream studies of T cell receptor (TCR) isolation, cancer antigen identification and molecular characterization of naturally occurring tumor-reactive T cells in human cancer. A secondary field of study is the de novo generation of tumor-reactive T cells through genetic engineering methods. One approach relies on the isolation and cloning of T cell receptors (TCRs) that confer non-reactive T cells with specific and potent immune function following gene transfer via recombinant lentivirus or retrovirus. Another approach relies upon the use of chimeric antigen receptors (CARs) that confer T cells with the MHC-independent specificity of a tumor antigen-specific antibody and potent T cell activity delivered by TCR and costimulatory domains. The Powell Lab also employs the CAR approach to test the function of novel costimulatory signals in anti-tumor immunity. Other current efforts include the exploration of immunomodulation to potentiate endogenous antitumor T cell responses, use of bispecific antibodies, pharmacological sensitization of tumor cells to immune attack, tumor vasculature targeting, preclinical validations, clinical translation and trial support. - Dr. Xiaojun Xu, M.D. - Dr. Qunrui Ye, Ph.D.
- Dr. Gen Shen Zhong,M.D. Urbanska, K., Lanitis, E., Poussin, M., Lynn, R., Gavin, B.P., Kelderman, S., Yu, J., Scholler, N. and Powell, D.J., Jr.: A universal strategy for adoptive immunotherapy of cancer through use of a novel T cell antigen receptor. Cancer Research 72(7): 1844-52, Apr 2012. Lanitis E, Poussin M, Klattenhoff AW, Song D, Sandaltzopoulos R, June CH, and Powell DJ Jr.: Chimeric Antigen Receptor T Cells with Dissociated Signaling Domains Exhibit Focused Antitumor Activity with Reduced Potential for Toxicity In Vivo Cancer Immunology Research 1(1): 43-53, July 2013 Notes: Published OnlineFirst April 7, 2013; doi: 10.1158/2326-6066. Kandalaft L.E. *, Powell D.J. Jr.*, Chiang C.L., Tanyi J., Kim S., Bosch M., Montone K., Mick R., Levine B.L., Torigian D.A., June C.H. and Coukos C. : Autologous lysate-pulsed dendritic cell vaccination followed by adoptive transfer of vaccine-primed ex vivo co-stimulated T cells in recurrent ovarian cancer Oncoimmunology 2(1): e22664, Jan 2013. Song, D., Ye, Q., Poussin, M., Harms, G.M., Figini, M., and Powell, D.J., Jr.: CD27 costimulation augments the survival and anti-tumor activity of redirected human T cells in vivo. Blood 119(3): 696-706, Jan 2012. Urbanska, K. and Powell, D.J. Jr.: Development of a Novel Universal Immune Receptor for Antigen Targeting: to Infinity and Beyond. Oncoimmunology 1(5): 777-779, Aug 2012. Lanitis, E., Poussin, M., Hagemann, I.S., Coukos, G., Sandaltzopoulos, R., Scholler N. and Powell, D.J., Jr.: Redirected anti-tumor activity of primary human lymphocytes transduced with a fully-human anti-mesothelin chimeric receptor. Molecular Therapy 20(3): 633-43, Mar 2012. Rech, A.J., Mick, R., Martin, S., Recio, A., Aqui, N.A., Powell, D.J., Jr., Colligon, T.A., Trosko, J.A., Leinbach, L.I., Pletcher, C.H., Tweed, C.K., Demichele, A., Fox, K.R., Domchek, S.M., Riley, J.L., Vonderheide, R.H. : CD25 Blockade Depletes and Selectively Reprograms Regulatory T Cells in Concert with Immunotherapy in Cancer Patients. Science Translational Medicine 4(134): 134ra62, May 2012 Notes: doi: 10.1126/scitranslmed.3003330. Song, D., Ye, Q., Carpenito, C., Poussin, M., Wang, L-P., Ji, C., Figini, M., June, C.H., Coukos, G. and Powell, D.J., Jr.: In vivo persistence, tumor localization and anti-tumor activity of CIR engineered T cells is enhanced by costimulatory signaling through CD137 (4-1BB). Cancer Research 71(13): 4617-27. Jul 2011. Moon, E.K., Carpenito, C., Sun, J., Wang, L.C., Kapoor, V., Predina, J.D., Powell, D.J., Jr., Riley, J.L., June, C.H. and Albelda, S.M. : Expression of a Functional CCR2 Receptor Enhances Tumor Localization and Eradication by Human T Cells Expressing a Mesothelin-Specific Chimeric Antibody Receptor. Clinical Cancer Research 17(14): 4719-30, Jul 2011. Lanitis, E., Dangaj1, D., Hagemann,I.S., Song, D. Best, A., Sandaltzopoulos, R., Coukos, G. and Powell Jr., D.J. : Primary Human Ovarian Epithelial Cancer Cells Broadly Express HER2 at Immunologically-detectable Levels. PLoS ONE 7(11): e49829, Nov 2012 Notes: Epub 2012 Nov 26.doi: 10.1371/journal.pone.0049829. Ye, Q., Loisiou, M., Levine, B.L., Suhoski, M., Riley, J.L., June, C.H., Coukos, G. and Powell, D.J., Jr.: Engineered Artificial Antigen Presenting Cells Facilitate Direct and Efficient Expansion of Solid Tumor-Derived T lymphocytes Journal of Translational Medicine 9(131), Aug 2011 Notes: Epub doi: 10.1186/1479-5876-9-131. Chiang, C.L. Maier, D.A., Kandalaft, L.E., Brennan, A.L., Lanitis, E., Ye, Q. Levine, B.L., Czerniecki, B.J., Powell, D.J., Jr. and Coukos G.: Optimizing Parameters for Clinical-scale Production of High IL-12 Secreting Dendritic Cells Pulsed with Oxidized Whole Tumor Cell Lysate Journal of Translational Medicine 9(1): 198, Nov 2011. Chiang, C.L., Hagemann, A.R., Leskowitz, R., Mick, R., Garrabrant, T., Czerniecki, B.J., Kandalaft, L.E., Powell, D.J. Jr. and Coukos G.: Day-4 Myeloid Dendritic Cells Pulsed With Whole Tumor Lysate Are Highly Immunogenic and Elicit Potent Anti-Tumor Responses. PloS ONE 6(12): e28732, Dec 2011 Notes: Epub 2011 Dec 14. doi: 10.1371/journal.pone.0028732. Dangaj, D., Abbott, K., Mookerjee, A., Zhao, A., Kirby, P.S., Sandaltzopoulos, R., Powell, D.J. Jr, Lamazière, A., Siegel, D.L., Wolf, C. and Scholler, N.: Mannose receptor (MR) engagement by mesothelin GPI anchor polarizes tumor-associated macrophages and is blocked by anti-MR human recombinant antibody. PLoS One 6(12): e28386, Dec 2011. Lanitis E., Smith J.B., Dangaj D., Flingai S., Poussin M., Xu S., Czerniecki B.J., Li Y.F., Robbins P.F. and Powell D.J. Jr.: A human ErbB2-specific TCR confers potent anti-tumor effector functions in genetically engineered primary cytotoxic lymphocytes Human Gene Therapy 25(8): 730-9, Aug 2014. Lynn RC, Poussin M, Kalota A, Feng Y, Low PS, Dimitrov DS, Powell DJ Jr.: Targeting of folate receptor-beta on acute myeloid leukemia blasts with chimeric antigen receptor expressing T-cells Blood 125(22): 3466-76, May 2015. David Bowtell, Steffen Böhm, Ahmed Ahmed, Paul-Joseph Aspuria, Robert C Bast, Jr, Valerie Beral, Jonathan S Berek, Mike Birrer, Sarah Blagden, Michael A Bookman, James Brenton, Katherine B Chiappinelli, Filipe Correia Martins, George Coukos, Ronny Drapkin, Richard Edmondson, Christina Fotopoulou, Hani Gabra, Jérôme Galon, Charlie Gourley, Valerie Heong, David Huntsman, Marcin Iwanicki, Beth Karlan, Allyson Kaye, Ernst Lengyel, Douglas A Levine, Karen Lu, Iain McNeish, Usha Menon, Steve Narod, Brad H Nelson, Kenneth Nephew, Paul Pharoah, Daniel Powell, Pilar Ramos, Iris Romero, Clare Scott, Anil K Sood, Euan A Stronach, Frances Balkwill: Rethinking Ovarian Cancer II: A Roadmap for Reducing Mortality from High-grade Serous Ovarian Cancer. Nature Reviews Cancer 15(11): 668-79, Oct 2015. Lynn RC, Feng Y, Schutsky K, Poussin M, Kalota A, Dimitrov DS, and Powell DJ Jr: High affinity FRβ-specific CAR T cells eradicate AML and normal myeloid lineage without HSC toxicity Leukemia Feb 2016 Notes: Epub ahead of print. doi: 10.1038/leu.2016.35.